STREET PAINTINGS! The city is a giant gear but it is up to all the crazy characters spiraling through it to fuel the machine! 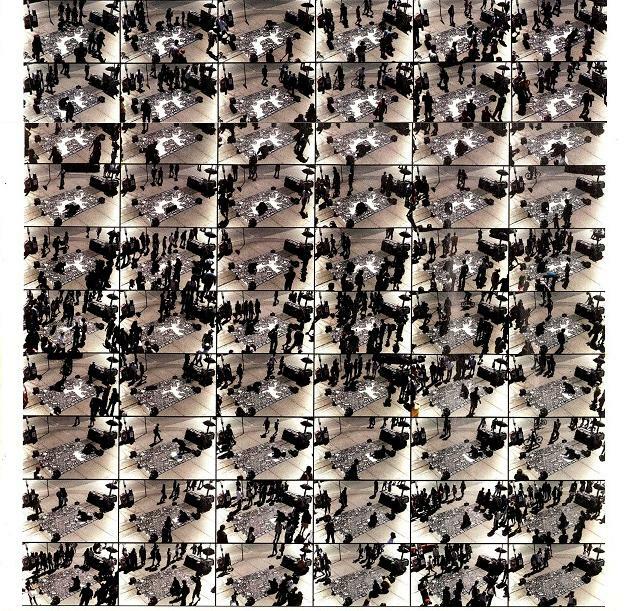 This time lapse photography depicts a day in the life of the “HEY APATHY!” graffiti art performances. 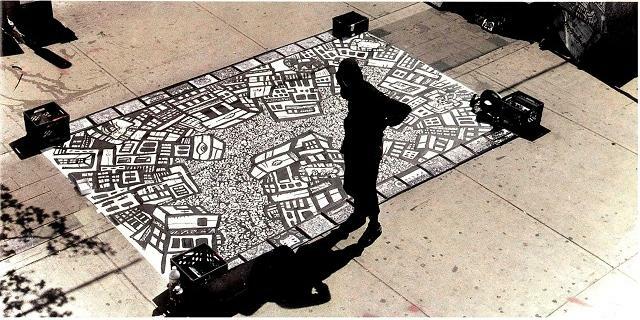 My basic routine was to tape a giant piece of blank paper to the sidewalks of Toronto's Queen Street West surrounded by busy shoppers and do live mural paintings under the hot sun. My display also included a portable shop with t-shirts, prints, small canvases and comics that I set up using a folding table and a shopping cart. During the weekdays I'd work on comics pages and talk to people and every Saturday I'd create one of these monstrous mural paintings measuring around 12 x 15 feet in 3-5 hours. The drawing in this photo shoot depicts my mythological City of Gears, an archetypal backdrop for my entire comic-style universe. As mentioned above the metaphor of the Gear is meant to exemplify the importance of each and every person as a part of the city. Often the "Big City" get a bad reputation for being dirty or dangerous but the truth is there is no such thing. If I learned anything while working as a street performer ( I didn't but if I did) it was that every single person has potential and that every single person's actions have an affect. No matter how small or how exciting the city, and the world is made up of all our ideas, interactions and reactions and there is really no one to blame for the state of society except ourselves. The mural was made in 3.5 hours in the summer of 2007. The performance was photographed by Craig Boyko from a second story apartment above the legendary Blackbull Tavern. The time lapse was featured as a two-page spread in PEACE Magazine a Toronto based publication that focuses on street art, fashion and culture. The complete documentation has also been compiled as a short animated time lapse video. I was always too busy painting to document my time on Queen Street so I was very fortunate to get this is incredible film made. The "City of Gears" time lapse video is certainly the best representation I have to show how crazy I was during my days doing street performances.